Up-cycling has become pretty popular in today’s society. Even though all processes aren’t exactly “neutral,” it still allows us do something meaningful; knowing we bring utility back to a discarded object. Yet, besides up-cycling, sustainable sources and process possibilities should become just as important to help us create (beautiful) products that at the same time, do not effect our environment too much. A designer to stylishly set an example is Emilie Grenier. 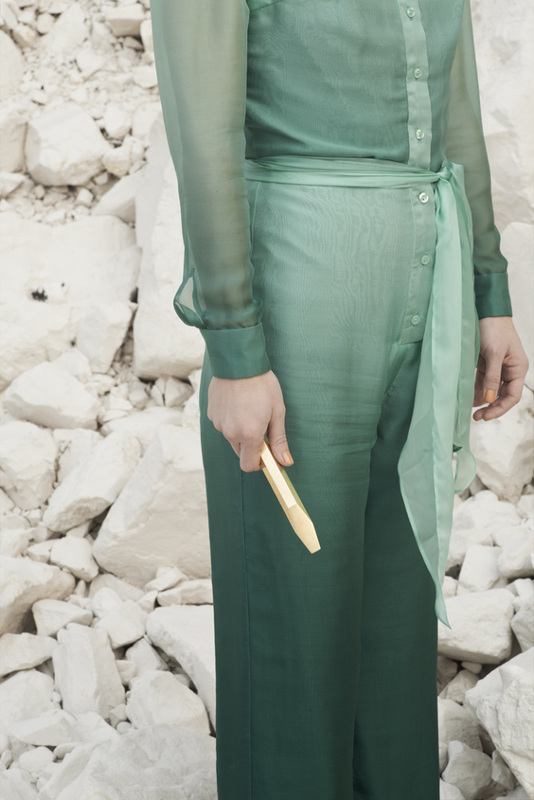 Emilie’s conceptual "Disquiet Luxurians" collection is fashionable, art/design and made from sustainable materials. "Disquiet Luxurians explores alternative trends for the production and consumption of rare and luxurious objects. This has led me to propose a new definition of the current state of luxury, one which (re)places most emphasis on meaning, craft and provenance. The resulting collection focuses on the material feldspar - the world's most prevalent mineral which makes up 60% of the Earth's crust. In designing a scenario in which it gains uniqueness, I have transformed this otherwise meaningless rock into a series of Post-luxurian artifacts, and in doing so challenged the gilded concept of rarity." Her beautifully polished stones absolutely challenge the present perception of luxury products and the materials they are made from. Emilie also has a great tumblr page, a source of refined beautiful imagery that clearly influenced her collection.